Keeping your parking lot in Kansas City compliant is very important to us. The Americans with disabilities act (ADA) was created back in 1990 to provide equal opportunities to the millions of people with disabilities that currently live in the states. Particularly, it has helped create facilities and adapt public spaces for people with disabilities. In 2010 the act was updated to enforce more adaptations to public spaces like elevators, ramps and of course parking spaces. In the new ADA standards, it says that parking spaces should accommodate and be redesigned according to the needs of people with disabilities since they are plenty of different type of disabilities the design has to be extremely inclusive. Depending on the type of handicap parking space, there are specific dimensions required for the spaces. The dimensions allow for easier access for patrons with a handicap. For example, someone in a wheelchair and someone with a cane it’s using the same parking lot, the parking lot should have a design that will allow the person in a wheelchair to descend from her vehicle and proceed to move without any restraining due to space while at the same time allowing the person with the cane to walk freely without getting in the way or getting cut off by the movements of the person in the wheelchair. The business and privately-owned facilities also have an ongoing obligation to ADA to always make their spaces disable friendly and to remove any barriers that will make movement difficult. Also, one of six available parking spaces should be van accessible and that’s a requirement. The accessible parking spaces should always be at the start of the parking facilities for better reach and access with the international sign for handicaps clearly visible, although the sign it’s not required if the parking space it’s a small one as long as there is a clear divisible line for further identification. Van accessible parking spaces should also have their van accessible symbol in a visible location. How Many Handicap Parking Spaces Are Required? ​When doing a new stripe job or restriping parking spaces to make it more accessible to people with disabilities you have to keep in mind how big is the space since you will need to dedicate at least 96 inches to a parking place for the handicaps, with the vans space having to be at least 156 inches. You should do the math by going with the number of parking spaces that are going to be available in the parking facility. For example, if your parking facility it’s going to have 100 parking spaces then you should have 5 accessible parking spaces and 1 van accessible parking place that meets all the ADA requirements for these facilities. If you have 50 spaces then it should be 3 dedicated to people with disabilities and 1 van accessible place. All accessible parking spaces need to provide an accessible route to the entrance of the facility without curbs or stairs and all accessible parking places should be located at the closest entrance of the facility. Even if the facility has several entrances the parking spaces should always have the shortest accessible route to enter it. Hospitals, rehabilitation centers, residential facilities and physical therapy facilities all have their own requirements different to parking facilities that they need to accommodate to. 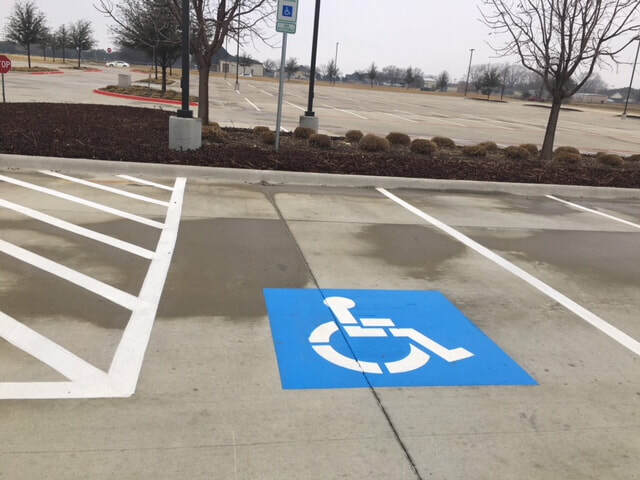 ​Our striping crews will also install the proper handicap parking signage to keep your parking area in full compliance. Once we come on-site we will show you where signs will be required, and also provide you with a free quote for professional installation of the signs.